Wonder Woman and Batwoman on the cover of Bombshells: United’s last chapter. 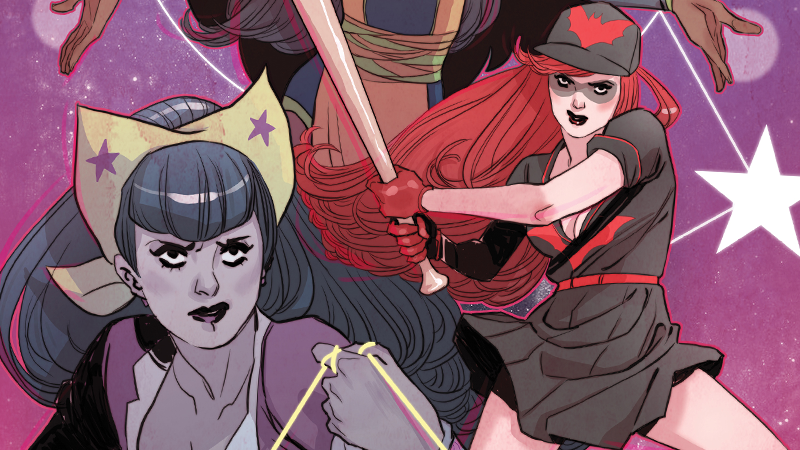 Bombshells may have started out as a line of retro-styled statues of DC Comics’ best female characters, but over the past three years it’s flourished—not just on the collectibles front, but as a long-running digital comic. The Bombshells’ story comes to an end tomorrow, and we’ve got a first look at the last chapter. Set decades after the events of the war, Bombshells: United chapter 38 sees creative team Marguerite Bennett and Marguerite Sauvage follow up on what became of the team and their allies, and the fallout of what came afterward on American shores. As you’ll see below, this fond farewell to these beloved takes on Wonder Woman, Batgirl, Harley Quinn, and a whole host of other DC heroines is framed through the inquisitive eyes of another familiar face: a grown-up Bruce Wayne, who remembers the days when a mysterious masked madam saved his family’s life outside a movie theater. The now-adult Bruce only has one question on his mind: Whatever became of the legendary Bombshells? The final chapter of Bombshells: United releases digitally tomorrow, May 11.